Search and Rescue workers from New York rescue a man from flooding caused by Hurricane Florence in River Bend, North Carolina, U.S. in this Sept. 14, 2018 handout photo. As Florence makes landfall in the Carolinas, the White House said that President Donald Trump plans to travel to areas affected by the hurricane. White House press secretary Sarah Huckabee Sanders said in a statement Friday that Trump would head to storm-damaged regions "early to middle next week" once conditions improve and it is determined his travel will not disrupt any rescue or recovery efforts. On Friday, Trump tweeted his support for the Federal Emergency Management Agency (FEMA), first responders and law enforcement, stating that they are doing an "incredible job." 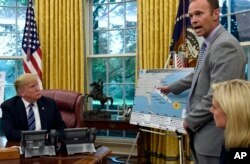 President Donald Trump (L) listens as FEMA Administrator Brock Long, center, talks about Hurricane Florence in the Oval Office of the White House in Washington, Sept. 11, 2018, as Homeland Security Secretary Kirstjen Nielsen listens at right. 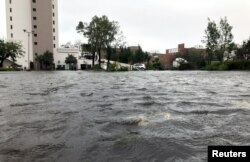 Fooded streets are pictured as Hurricane Florence moves into the Carolinas in Wilmington, North Carolina, U.S., Sept.14, 2018. At a news conference to discuss hurricane response and recovery early Friday, House Democratic Leader Nancy Pelosi responded to Trump’s tweet.